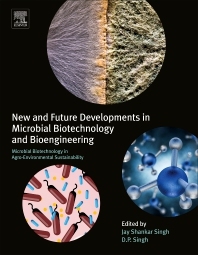 New and Future Developments in Microbial Biotechnology and Bioengineering: Microbial Biotechnology in Agro-environmental Sustainability describes, in detail, the various roles of microbial resources in the management of crop diseases and how microbes can be used as a source of income for biomass and bioenergy production. In addition, the book covers microbial inoculants as bio-fertilizers to enhance crop productivity, along with degraded land restoration. Users will find the latest information in the field of microbial biotechnology and its further applications in bio-fertilizers, bio-pesticides, its generation as an alternative source of energy, restoration degraded and marginal lands, the mitigation of global warming gases, and more. Dr. Jay Shankar Singh is presently working as a faculty member in the Department of Environmental Microbiology at Babasaheb Bhimrao Ambedkar University in Lucknow, India. Dr. Singh has contributed significantly to the subject of restoration ecology and natural resource management. He has published his research outputs in international journals with high impact factors on Scopus and other scientific databases. He is also actively serving as member of various scientific committees, holding editorial responsibilities for journals, such as Microbiology Research, PLoS ONE, etc. He has published several books from Springer and Elsevier, among others. Dr. D.P. Singh is Professor, Department of Environmental Science, Babasaheb Bhimrao Ambedkar University, Lucknow-226025, India. Prof. Singh has published around 100 research and review articles in reputed international journals with high impact factors. He is a Chairman/member expert of various executive/selection committees and serving as editor/reviewer for various journals. Dr. Singh's area of research is Environmental Microbiology and Bioremediation. He has written two books 1. “Environmental Microbiology and 2. Biotechnology, Stress Physiology”, published from New Age International (P) Ltd. New Delhi, India.